Am Abend des 11.04.2019 fand das Meetup #geomobMUC zum Thema „Maps for Machines and Geospatial Applications“ statt. Vielen Dank an Muthukumar Kumar, Managing Editor der Blog-Plattform Geoawesomeness.com, der dieses erste #geomob-Meetup in Deutschland initiierte und organisierte (#geomob sind eine Reihe von Events, die auch in London und Barcelona stattfinden). Gehostet wurde es in der Münchner Firmenzentrale der Firma NavVis, einem innovativen Lösungsanbieter für die Digitalisierung und Visualisierung von Innenräumen. Esri Deutschland sponserte das Event und sorgte unter anderem mit Bier und Brezn für das Wohlbefinden der Teilnehmer. Die Teilnehmer waren bunt durchmischt und stammten von einer Vielzahl von kleinen und großen Firmen und Organisationen aus München aber auch aus anderen Landesteilen. Lorenz Lachauer, Head Solution Factory Team bei NavVis, erzählte über die Herausforderungen und Möglichkeiten bei der Erfassung, Visualisierung und Nutzung von Daten für Indoor. Dario Manns, Co-Founder von FairFleet, präsentierte die technischen Aspekte des Backends hinter ihrem globalen Drohnen-Dienst. Yashar Moradi, CTO von CloudEO, erzählte über ihre Vision einer Geospatial Market Platform. Vor der Pause informierte Matthias Schenker von Esri über die Power von Storymaps und über ArcGIS for Developers für einen leichten Einstieg in die Entwicklung von Geo- und GIS Apps. Johannes Start, Product Owner von Artisense.ai, gab einen interessanten Einblick in ihre Technologie zur Erstellung von Karten für autonome Systeme. Jed Sundwall, Global Open Data Lead von Amazon Web Services, erzählte über freie Daten in Earth on AWS. Siegfried Hartmann, Founder von Analytical Semantics, berichtete über das Analytical Semantics Widget, einer dynamischen Verbindung zwischen Informationsmanagement und Geoinformationssysteme von Esri. Anschließend gab es noch eine spannende Diskussionsrunde mit allen Vortragenden zu technischen Fragen, aber auch Allgemeines wie beispielsweise zur Gründung von Startups. Das neue ArcGIS Runtime Major Release Version 100.5 wurde veröffentlicht. Mit ArcGIS Runtime können native 2D und 3D Geo-Apps für Windows, Android, iOS, Linux und macOS erstellt werden. Für das ArcGIS Runtime SDK for macOS wird diese Version 100.5 die letzte sein. Diese Plattform kann zukünftig mit den cross-platform-fähigen Java SDK und Qt/QML SDK adressiert werden. Unterstützung von Mobile Scene Packages. Dieses brandneue Format verpackt eine gesamte 3D Scene + Daten in eine Datei mit der Endung .mspk und kann nur mit ArcGIS Pro ab Version 2.3 erzeugt werden. Unterstützung von Reference Scale zum Skalieren der Größe von Symbolen und Texten beim Zoomen. Unterstützung des Next Generation Locators aus ArcGIS Pro ab Version 2.3, welcher schnellere und bessere Resultate und weniger Speicherplatz verspricht. KML Tour zum Präsentieren von Touren aus KML Files. Ausführliche Informationen zu allen Neuerungen in ArcGIS Runtime 100.5 findet Ihr in diesem Blog von Esri Inc. und in den Release Notes jeweils unter Guide -> Reference der verschiedenen SDKs auf dem ArcGIS for Developers Portal. Vollständige Informationen zu den neuen Versionen findet Ihr in diesem Esri Blog, und in den Release Notes zu Version 4.11 und Version 3.28. Developing a mobile mapping application means a lot of work. Besides the obvious work - the development of the mobile client - cartography is a not inconsiderable part of the whole work. Maps have to be designed that combine information from many different sources and then provide them in a mobile data format. But if the product of this export is also valid and displayed correctly in the mobile client you will not see it until you open the caches in it. So: How can you be sure, that your caches are valid as expected? In fact, there is currently no standard tool for checking caches. So if you have not completed any application, you had no way to check the data export. Until now. Because now there is a tool called ArcGIS Runtime Explorer, available on GitHub for free, which was developed exactly for it. This application was created by Esri Germany developers to facilitate their daily work. Just open and check a mobile geodatabase or the newer mobile map package format? No problem. It even supports multiple maps of an MMPK, as well as embedded locators. Raster data is also supported, both as part of the caches and as additional content to easily orient yourself. All data is displayed in a map, along with a legend with all symbols. Even bookmarks are evaluated and can be displayed. So far all the standard functionality that one would expect from a finished client. But there is a lot more in this tool. It shows a lot of little additional information that you would not get so obvious in most other applications. How many layers does the cache actually have and how many are editable? Are all layers currently visible or are individual elements just hidden due to the current scale? Where is my map extend and how tall is it? What is the extend of each layer? Is it congruent with other layers or are they different? But it's not just about looking at data. I am even able to manipulate this data. For example: I do not want to zoom in too deeply into the map because the background map will otherwise blur. From when that is the case I would like to test out and set therefore on the Map object the MaxScale property. In addition, I should not be able to zoom out more than on my country, so just try it quickly, as this fits best in the map, read off the scale factor and enter as MinScale property - done. Another example: the representation of my surfaces turns out to be opaque, in the truest sense of the word. The underlying base map is no longer recognizable. Practically, I can adjust the transparency so that I get the best possible view. It is even possible to set a filter on a layer using SQL Where condition and thus limit the displayed features. What is perfect? But it helps a lot if you do not have to put the same functions into an application over and over again just to look at a mobile cache. And this tool provides just a lot more information and possibilities. In addition, the tool is maintained and further developed, because it is just used. Moreover, because it is under a free Apache license, anyone can make changes to it and also give it back and thus contribute to the improvement of the tool. Therefore: it's free, use it! ArcGIS Pro 2.3 SDK – Was ist neu? Mit dem Release von ArcGIS Pro 2.3 wurde auch das zugehöriges ArcGIS Pro 2.3 SDK veröffentlicht. Mit diesem SDK können .NET Entwickler eigene individuelle Werkzeuge und Workflows für ArcGIS Pro erstellen. Ausführliche Informationen zu allen Neuerungen des ArcGIS Pro 2.3 SDK findet Ihr in diesem News Blog von Esri Inc. und in der ArcGIS Pro 2.3 API Reference. Date extraction from OpenStreetMap (OSM) can be performed in various ways. The OSM project features a website, where data can be extracted in the OSM-invented .pbf-format. External platforms provide already preprocessed and verified data from the websites. The Overpass API allows users to download small extents of data (approximately on town and suburb level) via a web request. This API acts like a database server and can be queried with a special database request language, Overpass QL. The free OSM2ArcGIS Python script, available on GitHub, is based on data requested via the Overpass QL using an adapted version of Jeffrey Scarmazzi’s osm_runner python module. The requested data is processed and converted to the ArcGIS SpatialDataframe format. After data processing in ArcGIS Online / ArcGIS Enterprise, a new feature service is created inside the user’s portal. Within the feature service, the data is organized in at least three different layers for the three available geometry types point, polyline and polygon (more layers for more configurations, will be explained later). The additional features of OSM2ArcGIS are explained in detail within the following sections of this blog entry. Following Python version and packages must be installed. The installation of Anaconda helps to keep existing python installations working by creating indepedent python environments. Users benefit from an Anaconda integrated package installation and administration interface. pandas >= 0.20.2: Can be found in the package list in Anaconda and installed directly. click >= 6.7: Can be found in the package list in Anaconda and installed directly. The other packages are installed by using the terminal and entering a line of code. ArcGIS API for Python must be equal or less than version 1.5.0 to work correctly with OSM2ArcGIS. Setup your python environment as described in the section “Requirements”. Download the files from the GitHub repository. Extract the files from the downloaded OSM2ArcGIS zip archive to a location of your choice. Adapt the content of the ArcGIS Online / Portal for ArcGIS configuration file agolconfig.json to match your portal URL, your username and password. Optionally adapt the content of the OpenStreetMap configuration file osmconfig.json to the desired region, add configurations or remove the sample configuration. The geodata contributed to the OSM project is not as standardized as data provided by governmental organizations or companies. There are guidelines inside the OSM wiki, but users operate various clients on various devices and are not forced to generate geometries in a specific way or provide detailed attribute values in exactly defined attribute fields. This may lead to problems when parsing the data and trusting on specific data types. Also using OpenStreetMap for a roadmap with exact speeds on road sections is not always a good idea when there is no exact unit specified in all road sections. That’s the reason we decided not to use integer or float data types in attribute data, all attribute data except the timestamp for every OSM object are stored as strings. Another challenge using OSM is related to the geometric data structure with way, node and relation objects. Nodes can be easily transferred to ArcGIS point objects, way objects not having the same start and end can also be easily transferred to ArcGIS polyline objects. More complicated output geometries are polygons, as they can be formed by way objects with the same start and end or relations, which connect multiple way objects to form a “multipolygon”. Relations can also connect multiple point objects or point and way objects. To take only relation objects into account, that form “multipolygons” by connecting way elements, the polygon-connecting relations feature the attribute “multipolygon” with the value “yes” (see figure below). Relations not forming “multipolygon” features are not regarded in OSM2ArcGIS. The configuration of OSM2ArcGIS can be defined by the user in two JSON-based configuration files, agolconfig.json and osmconfig.json. The first one enables the tool to establish connections to the ArcGIS Enterprise / Online portal. The latter is used to setup configurations for requests to the OpenStreetMap server. Explanation of all JSON attributes and examples for configurations are listed in the table below. - The desired OSM key for "categoryName" property. Multiple values not allowed here. - The desired OSM tags for "categoryValue" property. Multiple values in square brackets. - The excluded fields from service on ArcGIS Online for the "attributeFieldsToExclude" property. Multiple values in square brackets. - The geometry type, valid types are "line", "point" or "polygon". Multiple values not allowed here. OSM2ArcGIS was originally developed by Simon Geigenberger. The tool consists of seven modules, which are loaded, when they are needed at the current position in the program. The MainModule is loaded as the core part of OSM2ArcGIS and invokes the modules AGOLConfigHelper, OSMConfigHelper, OSMHelper and AGOLHelper. AGOLConfigHelper validates the configfile agolconfig.json, the module checks the availability of ArcGIS API for Python and then continues to check the configfile. A quick connection check with the given credentials in the configfile is also performed within this module. The module terminates the whole program if invalid values were specified within the configuration file. OSMConfigHelper validates the configfile osmconfig.json, the module checks the availability of ArcGIS API for Python and then continues to check the configfile. Categories and Tags available in OSM are downloaded from an OSM database and the values set in the configfile are compared with the values in the database. The module terminates the whole program if the set values or tags in the configfile are not available in the OSM database of valid tags/values, an invalid boundingbox or other invalid values are set within the configfile. OSMHelper module is designed to setup and control the requests sent to the OpenStreetMap server using the extended osm_runner module. The module is configured to optimize processing speed by creating threads, to simultaneously download data from the OSM server for the configurations in the configfile. Osm_runner module was originally developed by Jeffrey Scarmazzi and has been extended to process the relation entities with the attribute “multipolygon” and the value “yes”. Osm_runner_utils provides configuration settings used with the osm_runner module. Details on the OSM server request format can be set, as well as the output format for the server’s answer and additional filters can be changed by modifying this module. AGOLHelper expects an Esri SpatialDataFrame as input object and performs the creation of a feature service inside the user’s portal in ArcGIS Enterprise / Online and the upload of data for the defined configurations to at least one layer for every geometry type set in osmconfig.json. Uploads to the portal are performed using multiple chunks of data to prevent server errors on large datasets. OSM2ArcGIS makes it easy to transfer data from OSM to an ArcGIS Enterprise / Online portal. All you need to do is to setup your python installation, configure the tool via the JSON-based configfiles and to make sure, that you were granted at least a publisher role by your portal administrator. If you have any questions or comments please feel free to contact me or leave a comment in the comment section below. 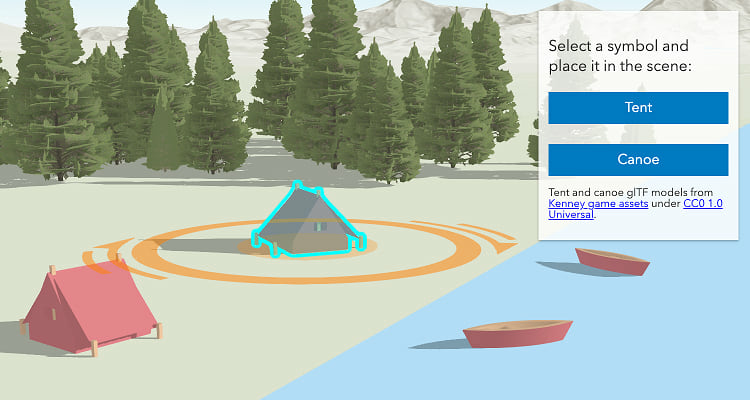 Mit dem Web AppBuilder for ArcGIS können ohne Programmierkenntnisse fokussierte 2D und 3D Web-Apps mithilfe von vielen konfigurierbaren, ready-to-use Widgets und Designs erstellt werden. Sollte die Funktionalität nicht ausreichen können Entwickler mit der Developer Edition bestehende Widgets und Designs erweitern oder vollständig eigene erstellen. Die neue Version 2.11 hat nun den gleichen funktionalen Stand wie der eingebettete Web AppBuilder in ArcGIS Online vom Dezember 2018 Release. Hinzugekommen sind hier z.B. zwei neue Widgets und etliche Verbesserungen bei bestehenden Widgets. Neu auf der Homepage der lokal installierten Developer Edition ist nun die sinnvolle Möglichkeit für Administratoren, auch Apps und Templates von Kollegen verwalten zu können. Vollständige Infos dazu stehen im Esri Blog und im What's New auf dem ArcGIS Developer Portal. AppStudio for ArcGIS ist eine innovative Anwendung zur Erstellung nativer cross-platform Geo-Apps für alle relevanten Plattformen. Apps werden einmal erstellt und sind dann und auf jedem Gerät sofort verwendbar. Mit der Standard-Version lassen sich die mit den konfigurierbaren Esri Vorlagen erstellten Apps weiter ausbauen, powered by ArcGIS Runtime. Nun ist die neue Version 3.2 verfügbar. Neben Bug-Fixes gibt es viele Neuerungen. Ausführliche Informationen zu den Neuerungen von AppStudio for ArcGIS Version 3.2 findet Ihr in diesem News Blog von Esri Inc., im Whats New und in der AppStudio GeoNet Gruppe. Vollständige Informationen zu den neuen Versionen findet Ihr in diesem Esri Blog und in den Release Notes zu Version 4.10 und Version 3.27. Das Lizenzmodell für ArcGIS Entwickler wurde geändert und ist jetzt einfacher und flexibler. Infolgedessen wurde auch der entsprechende Bereich der ArcGIS-Developer-Webseite angepasst. Ausführliche Informationen dazu, inklusive einer FAQ für Entwickler mit einer bestehenden ArcGIS Developer Subscription, könnt Ihr in den ArcGIS Blog nachlesen. Die ArcGIS API for Python ist das perfekte Werkzeug für das Automatisieren, Administrieren und Nutzen von ArcGIS Online und ArcGIS Enterprise. Vor kurzem wurde die ArcGIS API for Python v1.5.1 mit vielen Neuerungen veröffentlicht, nun wurde die Version 1.5.2 nachgeschoben. Der Schwerpunkt liegt auf der Unterstützung von User Types, die im ArcGIS Online Dezember Release eingeführt wurden (und Anfang 2019 in die nächste ArcGIS Enterprise Version eingeführt werden). Ausführliche Informationen zu allen Neuerungen der ArcGIS API for Python 1.5.2 findet Ihr in der ArcGIS API for Python GeoNet Gruppe und in den Release Notes im ArcGIS Developer Portal. 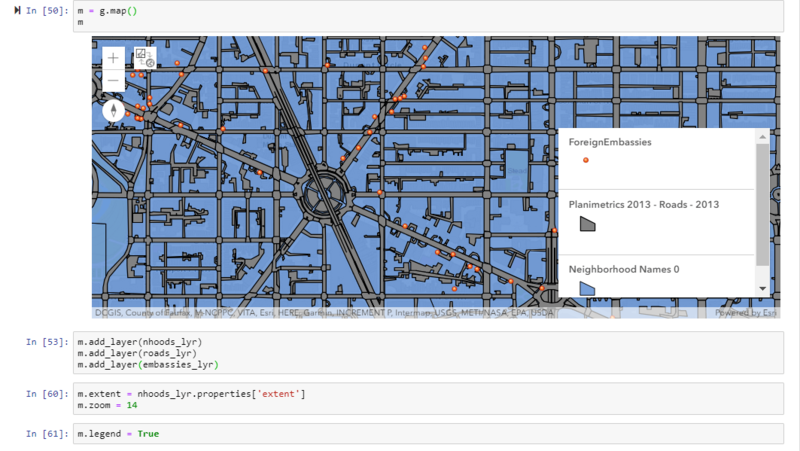 Ausführliche Informationen zu allen Neuerungen der ArcGIS API for Python 1.5.1 findet Ihr in diesem News Blog von Esri Inc. und in den Release Notes auf dem ArcGIS Developer Portal. Ausführliche Informationen zu allen Neuerungen in ArcGIS Runtime 100.4 findet Ihr in diesem News Blog von Esri Inc. und in den Release Notes, jeweils unter Guide -> Reference der verschiedenen SDKs auf dem ArcGIS for Developers Portal. Mit Web AppBuilder for ArcGIS können Anwender ohne Programmierkenntnisse fokussierte 2D und 3D Web-Apps mithilfe von vielen konfigurierbaren, ready-to-use Widgets und Designs erstellen. Sollte die Funktionalität nicht ausreichen, können Entwickler mit der Developer Edition bestehende Widgets und Designs erweitern oder vollständig eigene erstellen. Die neue Version 2.10 hat nun den gleichen funktionalen Stand wie der eingebettete Web AppBuilder in ArcGIS vom September 2018 Update. Neu ist ein Pocket Design für Web-Apps, das optimiert ist für das Einbetten in andere Apps, z.B. in StoryMaps. Neben dem wurden über 10 bestehende Widgets verbessert und/oder funktional erweitert. Das SDK wurde ebenfalls funktional erweitert und die Dokumentation wurde verbessert. Vollständige Auflistung der Neuigkeiten stehen im Esri Blog oder im What's New auf dem ArcGIS Developer Portal.